Whirled Music: The physics of whirlies! Us geeks have strange hobbies. 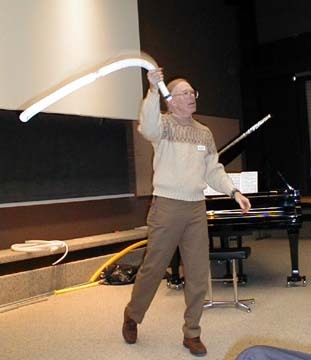 My old boss, Paul D., plays the corrugated plastic tube, also known as a “whirly.” I just posted a new episode of my Science Teaching Tips podcast where he plays the whirly (like a true master) and explains the science behind the sound. It’s not quite what you might think! I was surprised. I figured, as do most people, that it’s air moving across the top of the whirly, like blowing across the top of a soda bottle. It’s not. Listen to the episode – Whirled Music. More about the science of whirlies on Paul’s website here and here. And see a video on Steve Spangler Science here. How cool to see this out in the real world! My family adores everything Steve Spangler says and does. Have you signed up for his absolutely FREE Experiment of the Week? You get, in your email, an free experiment, complete with directions and video, etc, and so far they’ve been wonderful.